Preface; 1. Fundamental principles of special relativity; 2. Vector analysis in special relativity; 3. Tensor analysis in special relativity; 4. Perfect fluids in special relativity; 5. Preface to curvature; 6. Curved manifolds; 7. Physics in a curved spacetime; 8. The Einstein field equations; 9. Gravitational radiation; 10. Spherical solutions for stars; 11. 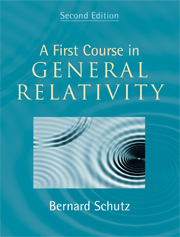 Schwarzschild geometry and black holes; 12. Cosmology; References; Index.